Startup Prayas Analytics says it’s giving brick-and-mortar retailers a new way to reduce customer wait times and otherwise make their stores more efficient. The company was founded by Yash Kothari and Pranshu Maheshwari, who are both entering their final year as undergraduates at Wharton and the University of Pennsylvania. And they’ve gotten backing from First Round Capital’s student-run Dorm Room Fund, which offers mentorship and $20,000 in funding. Kothari also contrasted his approach with that of Euclid and Nomi, which are more focused on marketing than on customer experience and operations. How long is a customer spending in line? As the third, fourth or fifth customer enters the line, how does the probability of their in-store abandon increase? How much is this costing our clients and how might they adopt certain policies to better manage their queues? 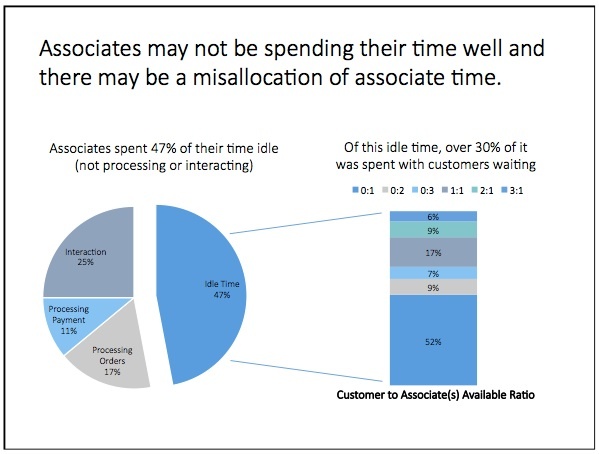 How many associates should you keep staffed at different times in the day to make sure you aren’t over or under staffing? If applicable, what do store operations look like for the self-checkout section? Prayas said it has already conducted one case study of “a Fortune 200 retailer,” finding that 4 percent of in-store customers abandoned their purchases, and that those customers had to wait 1 minute and 21 seconds longer than the average customer. The findings will allow the business to get smarter about how it staffs check-out desks through the day, the company said. To perform this analysis, Maheshwari said Prayas is using “off-the-shelf video technologies” paired with “pretty advanced statistical and probability models.” He also admitted that the product isn’t entirely built out yet; he estimated that the company is currently performing 60 percent of the analysis with technology, and the rest with manual analysis, but the goal is to lower the manual work over time.